Mulhouse — Dozens of Greenpeace activists sneaked into a nuclear power plant in eastern France at dawn Tuesday in the latest break-in by the environmental group to highlight alleged security weaknesses at atomic facilities. 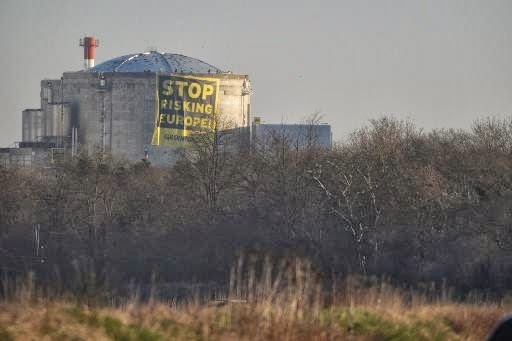 The activists broke into the Fessenheim plant and hung a banner reading "Stop risking Europe" on the side of one of its reactors "to denounce the risk of French nuclear power for the whole of Europe," the group said in a statement. A spokesman for state-run power firm EDF, which runs the plant, said it was functioning normally despite the break-in. "These actions will not have any impact on the working of the plant which is functioning normally," the spokesman said. Police had detained 56 activists, he said, but 20 remained on top of the dome of one of the reactors as a police helicopter hovered above. France, the world's most nuclear-dependent country, operates 58 reactors and has been a leading international proponent of atomic energy. But in a deal with the Greens before the 2012 parliamentary and presidential elections, President Francois Hollande's Socialist party promised to cut reliance on nuclear energy from more than 75 percent to 50 percent by shutting 24 reactors by 2025. Hollande has pledged to close Fessenheim, which was commissioned in 1977, by the end of 2016. The plant, located on the banks of the Rhine, is close to the Swiss and German borders and is considered vulnerable to seismic activity and flooding. The Greenpeace protest stunt comes ahead of a meeting by European leaders to discuss the future of the continent's energy policy. Greenpeace wants Hollande and German Chancellor Angela Merkel to push Europe towards a real energy transition, complaining that France relied too much on nuclear power, and Germany on coal, for electricity supplies. The natural resources of the planet are finite and will not support the continuation of what you've been doing. We've been saying this for a decade. Watch for increased science and increased funding for alternate ways of creating electricity (finally). Watch for the very companies who have the most to lose being the ones who fund it. It is the beginning of a full realization that a change of thinking is at hand. You can take things from Gaia that are energy, instead of physical resources. We speak yet again about geothermal, about tidal, about wind. Again, we plead with you not to over-engineer this. For one of the things that Human Beings do in a technological age is to over-engineer simple things. Look at nuclear - the most over-engineered and expensive steam engine in existence!